Cindy Banker MA, Dipl. ABT (NCCAOM)®, Five Element Shiatsu AOBTA®-C.I. Saturday, January 28, 2017 10:00-7:30 p.m.
Sunday, January 29, 2017 10:00-7:30 p.m. 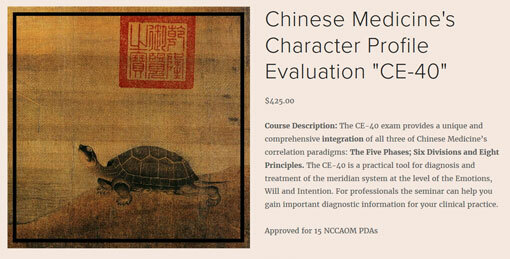 Course Description: In this weekend seminar participants will learn to use one of Chinese Medicine's most sophisticated and interesting assessment tools: the Character Assessment-40 (CE-40) written exam. The CE-40 profile analysis matches Chinese Medicine's meridian system with each of the eight categories described in the profile. An important principle in Chinese Medicine states that the spirit moves first, the mind follows and finally the Blood. The purpose of this seminar is to illuminate how this process works as it reveals the way in which our intentions direct Qi, how thoughts and emotions can contribute or detract from physical health, and to more fully understand our creative process. Named for its emphasis on the Six Division layering of external to internal, Cindy Banker will explain how the CE-40 exam provides a unique and comprehensive integration of all three of Chinese Medicine's correlation paradigms: The Five Phases; Six Divisions and Eight Principles. Click The Image To Attend! 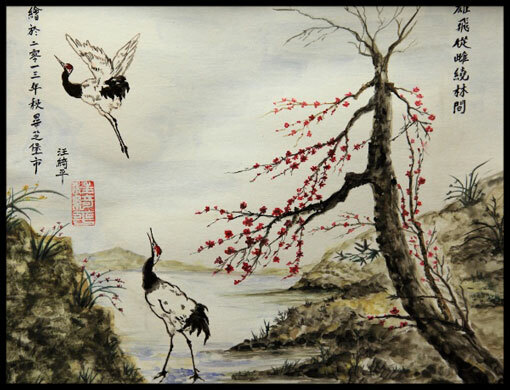 Saturday, January 14, 2017 10:00-6:00 p.m.
As a physician and scholar of the Ming dynasty, Zhang Jie Bin had access to the wealth of literature that formulated all of the theory now described as Traditional or Classical Chinese Medicine. Zhang Jie Bin's military background and brilliant mind helped him succeed in the extremely ambitious goal of re-organizing the original "classic" the Nei Jing into his own Lei Jing, published in 1624. A comprehensive clinical manual, the Lei Jing was used as a blueprint for the Chinese Medical textbooks that followed. Many sections, including the ones on Qing Zhi Bing (Emotional and Mental Illness) however, were deemed unscientific and purposely omitted. It is here that our own modern scholars can find de-scriptions of how Spirit, Emotions and the Mind act as primary drivers for both health and physical pathology. In this seminar we will read Zhang's original descriptions and discuss our own clinical experience in finding spiritual-emotional-psychological levels of resonance to be a source of health or physical pathology. Because this text has never been translated into English, Cindy's research and translation of key sections of the text provides a unique resource within the field of scholarly research. With a perspective gained though original translations, combined with a lifetime of clinical experience, Cindy will provide participants the opportunity to explore the brilliance of Zhang Jie Bin's work.